In 1957 Morris Pesin, a Jersey City businessman, attempted to take his family to visit the Statue of Liberty. The trip took several hours even though the Statue is less than 2,000 feet from the Jersey City waterfront. At that time the only way to get there was via a ferry from Battery Park, New York. Shortly after his family outing, Mr. Pesin arranged a demonstration for the press; he canoed from Black Tom to the Statue in 8 minutes. In 1964, President Lyndon Johnson declared Ellis Island a National Monument and promised to beautify the island and the area of Jersey City behind it. 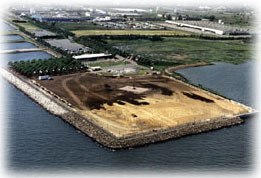 Jersey City gave the State of New Jersey in 1965, 156 acres, including Black Tom, which became the nucleus of Liberty State Park. The deserted and decaying ruin of the CRRNJ Terminal, and adjacent acreage, was added through local, state and federal funds. A massive clean-up campaign begun and by1975 the terminal building was added to both the State and National Registers of Historic Places. In 1976, Governor Brendan Bryne announced that Liberty State Park would be ready for the nation’s bicentennial celebrations, and that it would be “New Jersey’s gift to the Nation.” The park was dedicated on Flag Day, June 14, 1976. 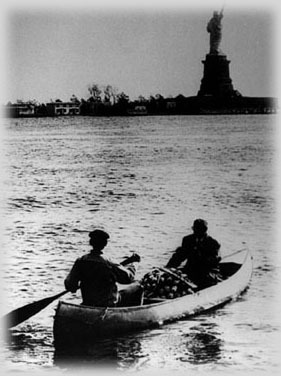 In September of 1977, the first ferry from New Jersey to the Statue of Liberty began operating from the park. The Interpretive Center, in 1985, began offering environmental programs to local schools and the public, and historical programs were introduced at the terminal. In 1989, a rededication ceremony marked the CRRNJ Terminal’s Centennial. Liberty State Park has continued to grow and develop. Today the Park encompasses 1,212 acres, of which some 300 acres is currently open to the public. Within the Park, Liberty Walk offers scenic views of the Statue of Liberty, Ellis Island, and the New York Skyline. The 88-acre Green Park has wildflower meadows, lawns, a playground with restroom facilities and a parking lot, plazas and a network of paved pathways, and the Columbus Monument – a gift from Italy marking the quincentennial of Columbus’ voyage to the New World. The park also contains the Liberty Science Center, a privately run family museum, with the nation’s largest IMAX dome-screen theater. The 500 slip Liberty Landing Marina and the Liberty House Restaurant, are other privately owned and operated facilities within the park.